Wedding scene in Post Office Square. 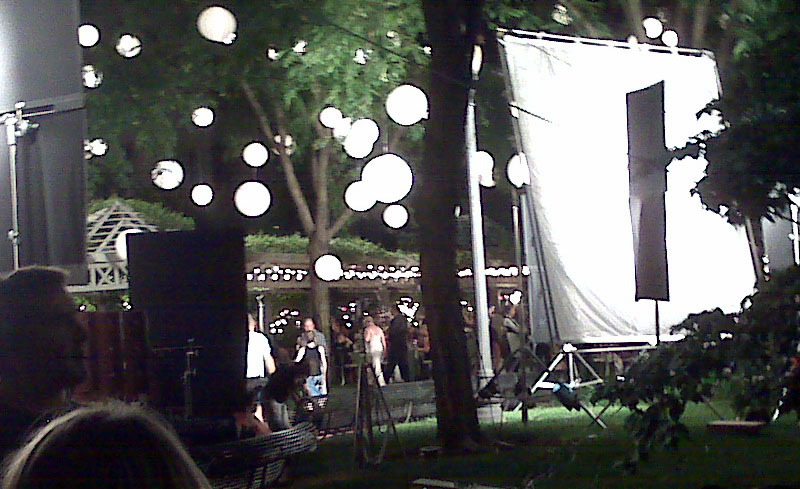 So I was just innocently walking to meet some friends in Boston’s Financial District last night, and I stumbled across the set of What’s Your Number?, a new film starring Anna Faris, or “the chick from the Scary Movies,” as some curmudgeon and jaded PA told me. According to imdb.com, the basic storyline is “a woman looks back at the past twenty men she’s had relationships with in her life and wonders if one of them might be her one true love.” That’s a lot of relationships right? How old is this woman? I guess not all of them were serious, if you know what I mean. The cast lineup looks really great – in addition to Faris, who I think is kind of funny sometimes, this movie stars Chris Evans, Zachary Quinto, Chris Pratt (Faris’ hubby in real life), Andy Samberg, Joel McHale, Ivana Milicevic and Dave Annable. I love that another movie is shooting in Boston! Excited to see the end result!